The Chain by Robin Lamont (Animal Suspense) is available through Grayling Press and Amazon. Robin Lamont’s novel The Chain, the first book in The Kinship Series, hooks readers from the very first page. From there, Lamont doesn’t let up as she engulfs readers in a world where the stakes are life and death. 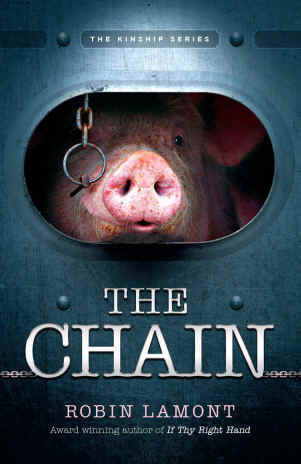 The Chain follows Jude Brannock, a strong compassionate woman who works with the animal rights organization The Kinship to fight for the humanity of all living things. She travels to the small town of Bragg Falls to meet with a slaughterhouse worker, turned under-cover investigator, regarding shocking abuse and horrific inhumanity endured by pigs at D&M Processing. When Jude learns that her informant has died of an apparent suicide, she puts on her investigator hat and exposes a spiderweb of neglect that encourages the atrocious treatment of animals and provokes employee injuries. Throughout the novel, readers get a peek inside of the D&M slaughterhouse. Lamont doesn’t shy away from the violent imagery that occurs in that deadly setting. She illustrates everything from the terror felt by the animals as they approach the plant to the gruesome realities of the kill floor. Readers also get a glimpse of the pressure and intensity that the workers, many of whom are undocumented immigrants, deal with on a daily basis as they work in an unimaginable environment. As Jude dives deeper into her investigation, she meets a series of individuals who give insight on the sad realities of working in a slaughterhouse. Emmet, a newly promoted D&M manager, tries to level with Jude about how the entire town depends on the slaughterhouse in one way or another. His despondent daughter Caroline is inspired by Jude’s passion and becomes an ally to animals. Jude also meets a few dangerous enemies along the way. With The Chain, Lamont does a brilliant job of promoting the betterment of animals while providing readers with a story that will have them on the edge of their seats. On top of that, the characters are well-rounded and interesting and the writing is nothing short of exceptional. We can’t wait to follow Jude as she investigates a government agency which is recklessly killing animals in The Trap, the next edition of The Kinship Series. Robin Lamont worked as a Broadway actress and singer, an undercover investigator and a New York Assistant District Attorney. The Chain is the first book in the Kinship Series, which through the power of story is spreading awareness about our treatment of animals. She will soon release The Trap about the hidden activities of the USDA’s Wildlife Services.